Caitlin Doughty is a mortician who is well-known for her YouTube series “Ask a Mortician” and for her best-selling memoir Smoke Gets In Your Eyes, which charts her experiences working in the funeral industry. In 2011, she founded the Order of the Good Death in order to promote death-positivity and to advocate for better mortuary practices. Most recently, she wrote From Here to Eternity, a book in which she explores little-known death practices, from an open-air cremation pyre in Colorado to families in remote Indonesian communities who live with and even sleep beside their mummified dead relatives. We interviewed her to find out what her journey taught her about mortality and why the death-positive movement is so appealing to feminists. Roman Road Journal Editorial: In your new book, you travel around the world exploring unusual funeral practices and ways of interacting with the dead. What was it that prompted you to take this journey and expand your experience beyond the US? Caitlin Doughty: I’ve been working in the funeral industry for almost 10 years now. Something that I hear a lot when I talk about other death rituals from around the world is, “oh, that’s so gross”, or “that’s so morbid, that’s so disrespectful”. In the first book I wrote about cannibalism, and how I thought that was a bridge too far for me, to hear about mortuary cannibalism, but when you learn how and why the tribe in question performed cannibalism with their dead, all of a sudden it began to seem like quite a beautiful, meaningful ritual. I wanted to get that across at a broader level, and to convey the idea that we need to apply some cultural relativism to our understanding of death practices. We should realise that what we consider to be morbid, can for someone else be an incredibly intimate ritual with the dead, and it is often much more rich and creative than many of the death practices we currently have in the western world. RRJ: What was the most surprising response to death that you came across on your travels? CD: I think I the most surprising thing came from the places where people have more extreme and intimate relationships with dead bodies over long periods of time. In Bolivia, for example – where they keep a rack of 60 skulls in the house and use the skulls to communicate with the beyond and ask for help in love and family and finances – or in a village where people take out their mummified loved ones seven years after they’ve died. I think the most surprising thing was just how normalised it was. There are kids running around and playing, there are guys chatting and smoking cigarettes, there are women gossiping; it feels like any town anywhere in the world, and there’s nothing that indicates that there’s any sort of transgressiveness to what they’re doing, even though we would consider their actions to be very transgressive in the west. RRJ: It’s interesting that this normality comes alongside a strong sense of ritual, which is often very formal. You talk a lot about the need for ritual in the book and the need for a meaningful practical experience with the dead in order to grieve and cope with loss. Why do you think ritual is so important and why is it a shame that we seem to have lost it in the western world? CD: I think when you hear the word “ritual”, you do think of formality and of something very proscribed. But most of the rituals that I saw weren’t really like that. They had an endedness to them, they had a “grieve how I’m grieving now” feel to them. So for example in Mexico there’s the Day of the Dead, and this is the one time of year when the border between the living and dead thins, and people go to the cemetery and they bring flowers and food and candles, and they sit around on the graves and there are fires burning and there’s music. It’s not ritualised necessarily, but it is a ritual, because it’s an interactive presence with the dead and it means showing up and being there and giving some physical manifestation of your grief. And I think in the western world, the only understanding of grief that we have is internalised: it’s feeling sad at night or wondering why we feel unfulfilled or wondering why there’s this sadness that we can’t get over. We never have any kind of physical or externalised ritual to help us, whereas in other places around the world there are all kinds of physical rituals that help people to come to terms with the death of a loved one. For example, in Japan, they do a ritual where they pull the bones out of the cremation chamber and the family uses chopsticks to pick out all the pieces of bone and place them in the earth, starting with the feet and moving to the head. It’s a simple thing, it’s not overly formal, but there’s still a feeling of doing something for the body, of being part of the process of transitioning this person from living to dead. So I think in the west we could learn a lot from giving ourselves space to do small physical things to deal with death, whether that’s dressing your mother in her favourite sweater after she dies, or doing her hair, or throwing some dirt into the grave, or even pushing the button when the cremator starts. These physical acts can serve as our ritual and make us feel as if we’re somehow involved with the process. RRJ: A lot of your work focuses on funeral practices in the US since that’s where you’re based. Over here in Britain, open-casket funerals are extremely rare and it’s very unusual for someone to see a dead body at all, unless they’re physically there when the person dies. Do you think it’s better to have the “American” experience where you see the dead body but it’s been preserved and is wearing make-up and formal clothes, or to have the “British” experience where you never see the body at all? CD: I think it’s kind of a case of Sophie’s choice between what’s worse. Is it better to see the body but it’s this waxen figure with garish make-up on, or is it better to just shut it out entirely? I kind of see the US and the UK as two sides of the same denial coin. The UK is more discrete, while the US is more interested in spectacle. But the middle ground between them is really what both countries would have done 150 years ago, which is seeing the actual dead body. It would be in the home for a day or two, and people would have that ritualised time to be present with the body. We’re not making it up or making it look alive or hiding it completely: instead people are faced with the reality of the situation. I think the US is becoming a lot more like the UK because people don’t realise that they have other options. They know they don’t want to see this creepy dead body and they know they don’t want to pay $10,000 for a funeral service, so they’re just saying “let’s just cremate them and not see them at all”. RRJ: When reading about your work and about the Order of the Good Death, it’s noticeable that many people who are involved in the organisation and who work in the death industry are women. Why do you think the concept of reclaiming death appeals to a feminist frame of mind? CD: I think there are a couple of reasons. One is that women bring people into the world with their physical bodies and I think there’s an attraction to seeing that all the way through. It’s part of knowing that we create death when we give birth, and wanting to be there at the time of death as well, and to be present and to experience that part of life. It’s also done with the knowledge that we used to do that, women used to be the ones who took care of the dead body, and when it became an industry that was largely taken from women, and that task was taken away and monetised by men. I think there’s an awakening of that knowledge, and there’s also a rumbling in the subconscious that women are fundamentally connected to this mortality and they want to be part of it. and they’re wondering why they can’t be, and when they realise what’s really going on they decide they’d prefer to tend to the dead body themselves. In the past, women have also been closely involved in our mourning traditions. If you look at Victorian mourning traditions, such as hair work, they were almost invariably carried out by women, and this is also something that we’ve lost recently. RRJ: The Order of the Good Death has worked with museums and curators to create death salons, and you’ve also pointed to artists and designers who are engaged with progressive burial practices. What role do you think art and culture can have in helping us to come to terms with the idea and of death and in changing our perception of how we deal with death? CD: I think there’s all manner of ways that they can do that, and I wanted to work with artists from the very beginning because I think if you just have practitioners then it becomes like a conference. Artists are sometimes willing to tackle something that’s as difficult to talk about as death and something that’s as difficult to get excited about as death. 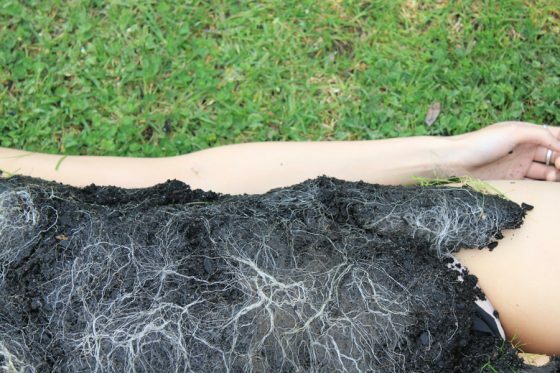 There are artists who are designing shrouds that decompose in the ground, or who are designing mushroom burial suits, and we have artists who are creating new spaces to die and to be cared for in. The fact that we have these artists who create things that excited people visually and that people want to be part of, that’s really valuable to us, because all of a sudden you have people sharing things online and starting a conversation that way that would be very difficult to start just by saying “I’m a mortician and you should talk to your dad about death” or “what do you want when you die? here’s the reasons that it’s good to talk about it.” But when you get something saying, “oh, did you see that mushroom burial suit? Would you want something like that? What do you want when you die?”, then it’s much easier to start a natural conversation. Caitlin Doughty’s new book From Here to Eternity is out now with Orion Books. Read more about Caitlin and her work on her website.